If you were not here last night you really missed out! What are the incredible service. It was a great reminder of what will happen if we fail to do Great commission ministry here at home. As leaders in the church you are a big part of Sing great commission ministry done here at home so that missionaries around the world can go as well. Thank you to all of those who volunteered, attended, and helped to make this year is a missions conference a success. Yesterday I saw a young man who is a part of our class at McDonald’s when I was in line to get a drink. This young man receive Christ on GROW last year and was baptized and now attends our class. He told me, “Hey, I passed out one of those Easter invites and the guy actually took it!” Isn’t that great? He is beginning to grow in evangelism! There are only two Sundays between now and Easter on April 21st, so let’s make the most of them. There are invitations in every classroom, so let’s emphasize using them to our class members, and let’s get them in their hands. 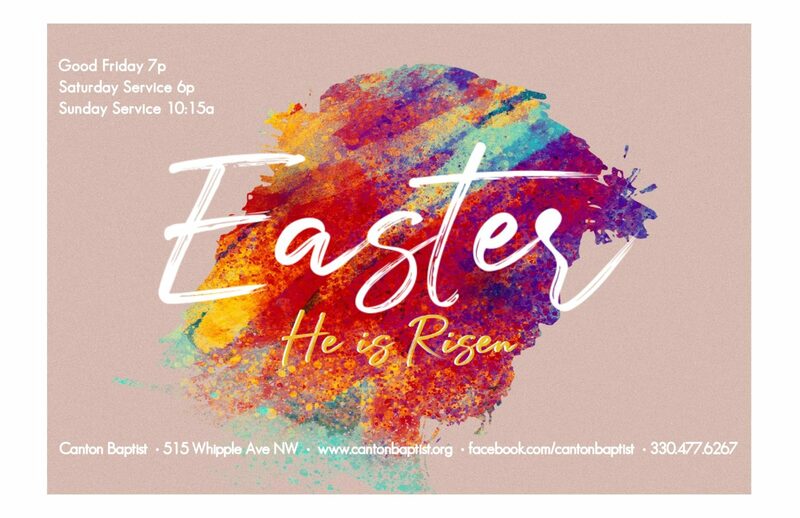 For more information to help you make the most of this Easter season go to cantonbaptistabf.org/easter2019. Please make the following announcement in your classes on Sunday. In the Student Ministry Classes please have those whose parents do not come to fill out the card. A member of the Women’s Ministry team will be there this Sunday (April 7th) to make a plug for the Mother/Daughter banquet as well as the Rummage Sale. Our mission: Reach People. Teach People. Minister to People.